Be fascinated by Tuscia, the historical region that includes the territories that were under Etruscan influence. You’ll admire Viterbo, in particular, the necropolis of Tarquinia, one of the most important in the Mediterranean area and home to the first example of painting in Italy. You’ll savour real Italian cuisine and wine at Montefiascone, explore Assisi and discover the city of Narni, which inspired C.S. Lewis to write The Chronicles of Narnia. You’ll see the city, famous for its medieval appearance, stone buildings and narrow streets. In Perugia, you’ll discover its gay life and the secrets of chocolate by visiting the Perugina’s House of Chocolate. A tour full of relaxation and fun as well as culture for those who want to make the most of their trip. Private transfer to Viterbo and your 4* hotel. 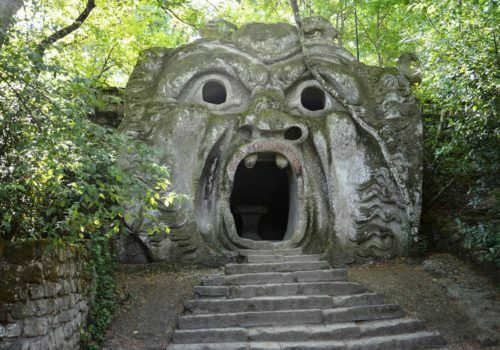 You reach Bomarzo to visit the bizarre “Park of the Monsters” to see the many larger-than-life sculptures including dragons, sirens and bears. In the afternoon you’ll visit the medieval city centre of Viterbo and the hidden part of the city with its basements. Galleries entwine together under the town and lead beyond the city walls. The rest of the day is yours to enjoy and explore. Overnight. Private transfer to the necropolis of Tarquinia, one of the largest and most important in the Mediterranean. With its large number of tumulus tombs with chambers carved in the rock, you’ll find 6,000 graves cut into the rock. It is famous for its 200 painted tombs, the earliest of which date from the 7th century BC. At the end of the visit, you’ll be driven to Montefiascone for a wine tasting session trying out the local wine known as Est! Est!! Est!!! Legend has it that a prelate sent ahead of his bishop’s meeting with the Pope, wanted to ensure the bishop stopped at an inn in the region so he could sample the brilliant wine. You’ll also see downtown where you’ll find a former Papal property. The castle was often residence of popes and was extended and improved over the centuries. At the end of the trip, you’ll return to your hotel and overnight. Private transfer to Narni, the city which has given the name to the iconic “Chronicles of Narnia”, the best-known work of C.S. Lewis. You’ll visit the heart of the city and go underground where you’ll see a tank from 2000 BC, prison cells and some byzantine mosaics all rediscovered in the 1970s. After the visit, you’ll be chauffeured to Perugia to your hotel. Visit to Perugina’s House of Chocolate, the most famous Italian chocolate factory, where you’ll hear (and sample!) the secrets of chocolate production. With your guide, you’ll visit the city centre to discover the Cathedral of San Lorenzo and monuments such as Fontana Maggiore, a medieval fountain located in the heart of the city. In the evening you’re free to explore. If you fancy hitting the town we’d recommend Lido Village Disco. 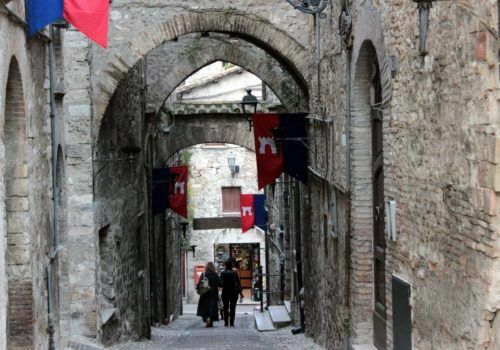 Head to Assisi for a guided tour of the city. You’ll see the Basilica of St. Francis with frescoes by the late-medieval artists Cimabue and Giotto and its famous bell tower. You’ll also explore the Communal Square up to the temple of Minerva. The afternoon is yours to explore further, relax or shop before returning to Perugia.